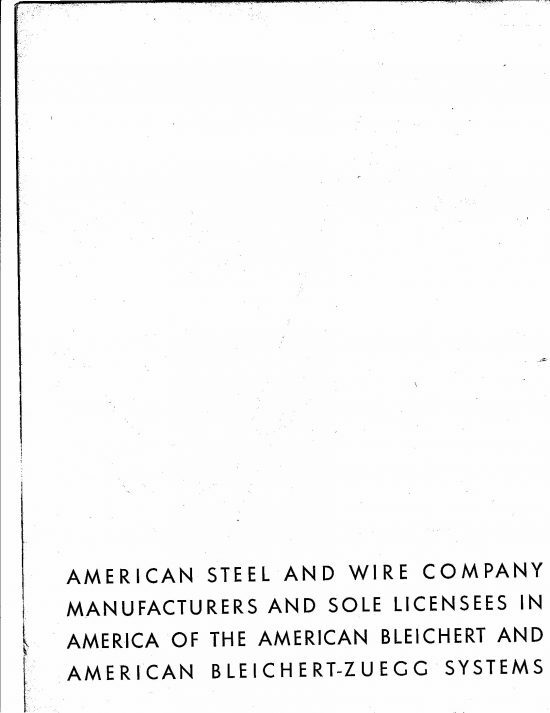 Trenton Iron / American Wire & Steel / U.S. Steel - Bleichert & Co.
Adolf Bleichert & Co. German engineering company which started to expand into other continents by the end of the 19th century has been ever since the main partner for the U.S. market of the American company Trenton Iron from Trenton NJ, which later became American Wire & Steel Co. / US Steel Corporation. 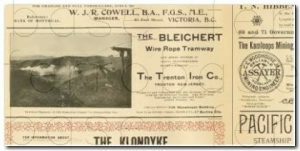 Adolf Bleichert & Co. licensed in 1888 the Trenton Iron Company (owned by Cooper, Hewitt & Co.) to build and sell Bleichert-Wire Rope Ways in the USA as well as on the Canadian market. 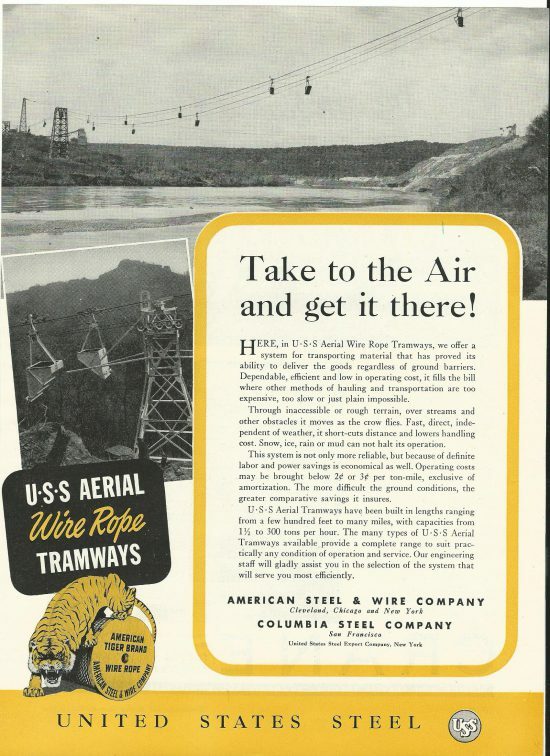 The Trenton Iron Company soon there after was able to sell a great number of wire rope ways in the USA including in Alaska. 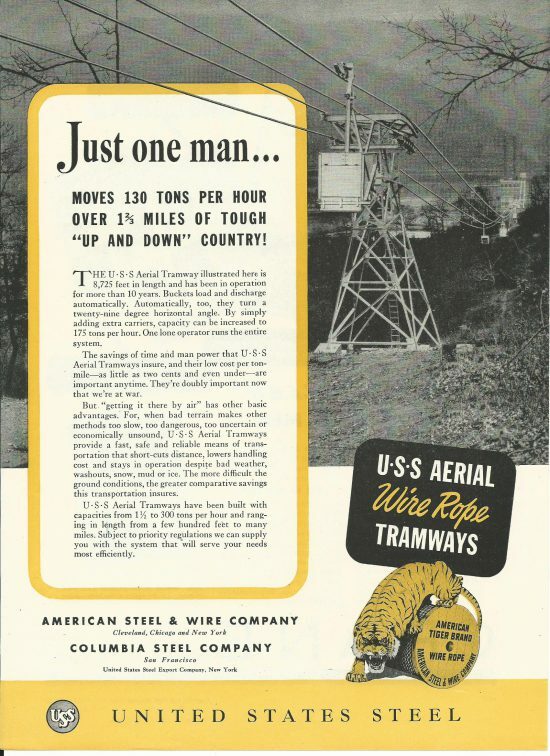 It appears unlikely that Adolf Bleichert & Co. would have been able to market in America an economical cable way manufactured in Germany. 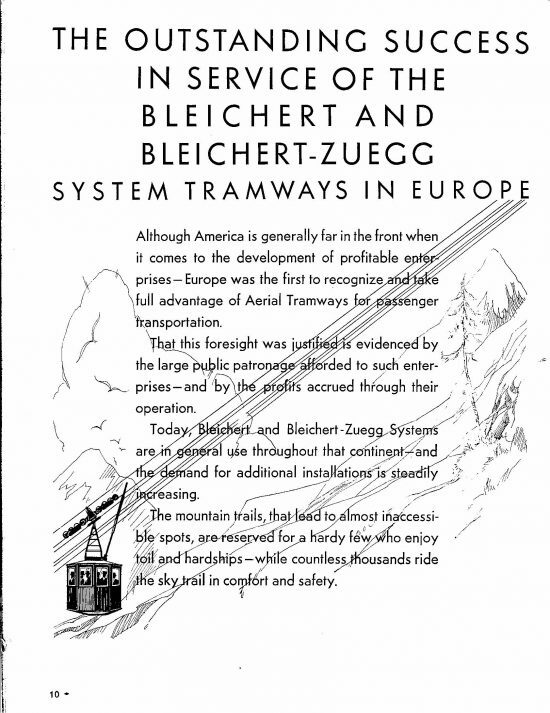 Bleichert was aware that his Two Rope System was superior to the American Mono Cable System – but it was too expensive. 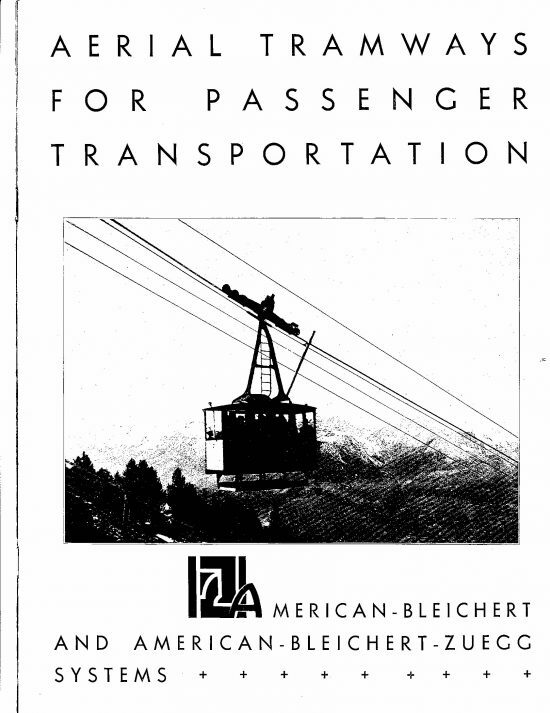 Many mines and quarries understood that in the long run the Bleichert System could achieve substantial savings and would have been prepared to pay the higher initial construction and material costs. 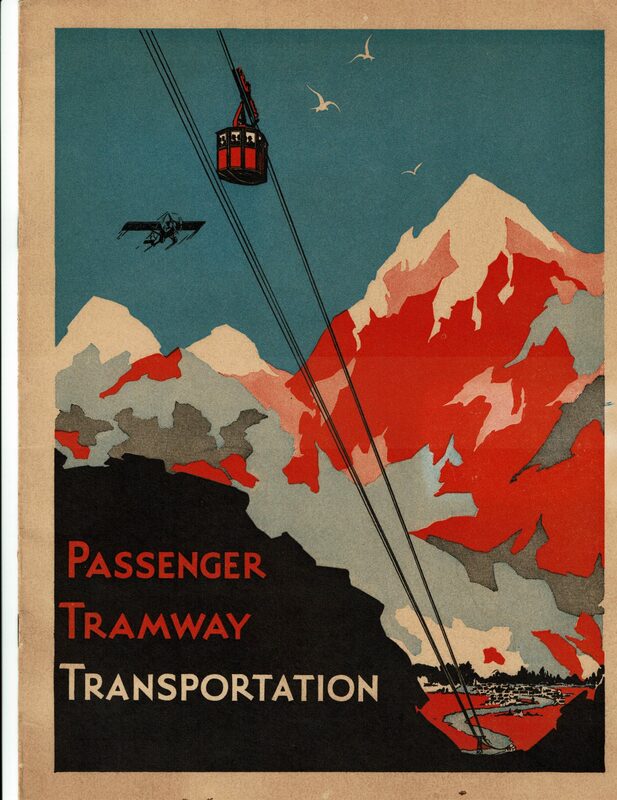 However, freight costs from Europe rendered the final product uncompetitive besides the additional risks for deliveries from overseas. 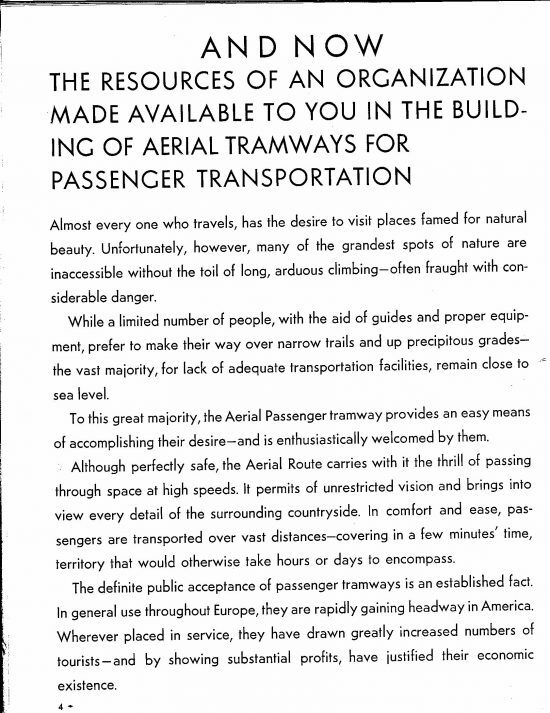 Bleichert being anxious to enter the American market must have recognized the advantages of a licensing agreement. 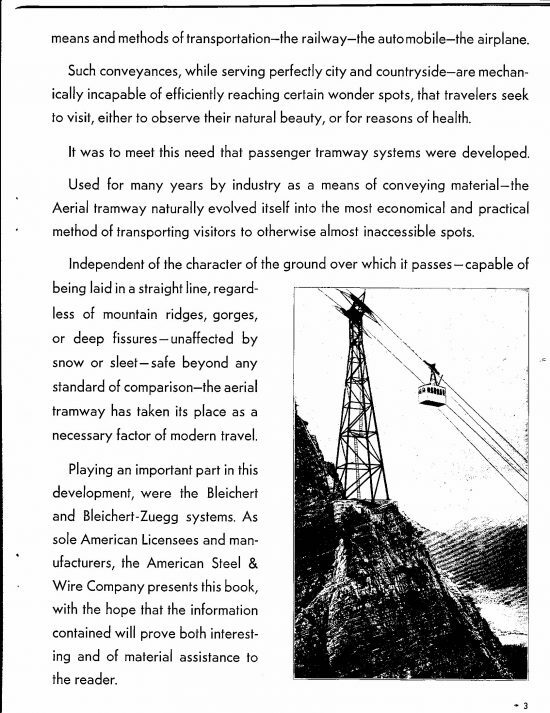 To push the introduction of their proven products (which in their opinion sold themselves) Bleichert entered into a license agreement with the American company Cooper, Hewitt & Co. 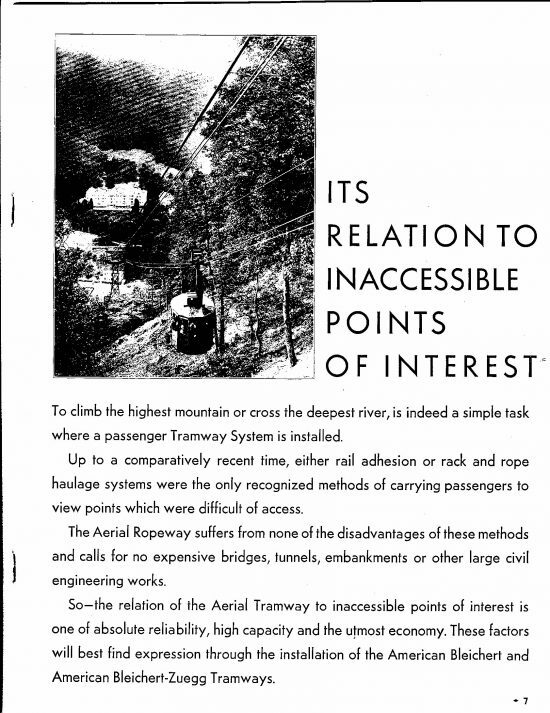 Although the Bleichert-System was known in America during the eighties, it appears that no installations were built outside of the Trenton-Agreement. 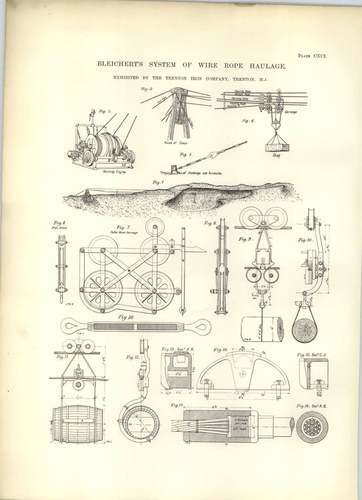 The Bleichert Wire Rope System was patented in the United States in 1888 only. 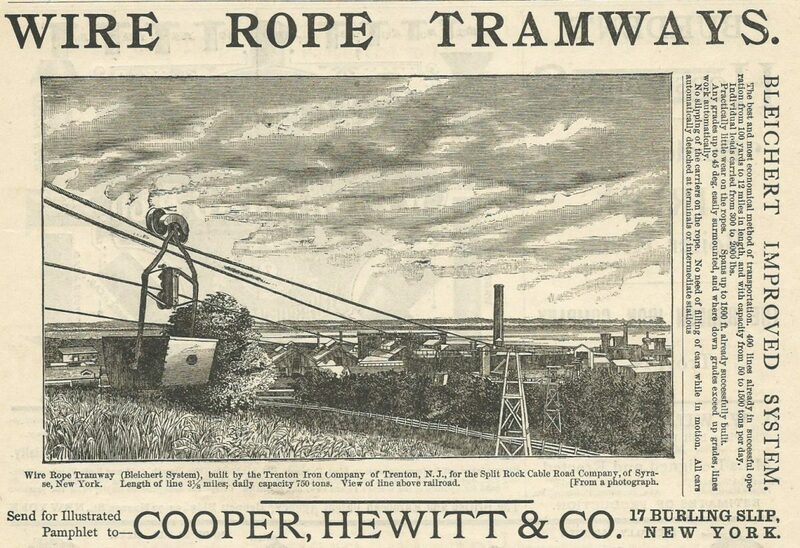 Shortly there after a license agreement between Adolf Bleichert & Co. Leipzig (Germany) and Cooper, Hewitt & Co., New York, N.Y. (USA) seems to have been completed. 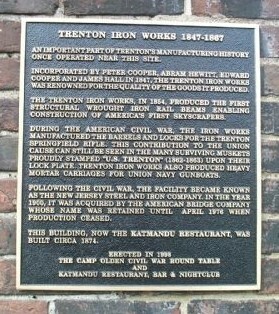 The ‘Trenton Iron Company” in New Jersey was part of the Cooper, Hewitt & Company group. 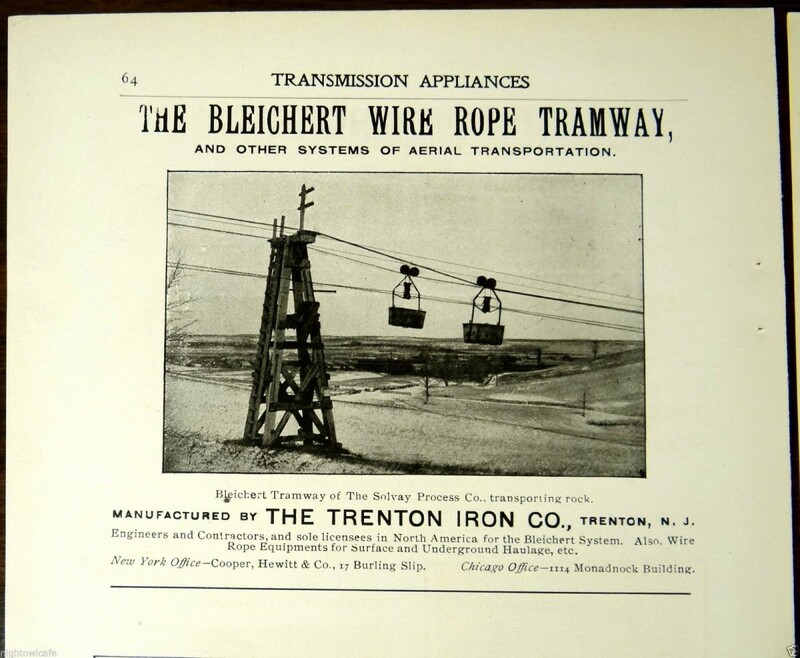 The first Bleichert-Trenton rope ways were built on the East Coast for coal mines and quarries between 1888 and 1890. 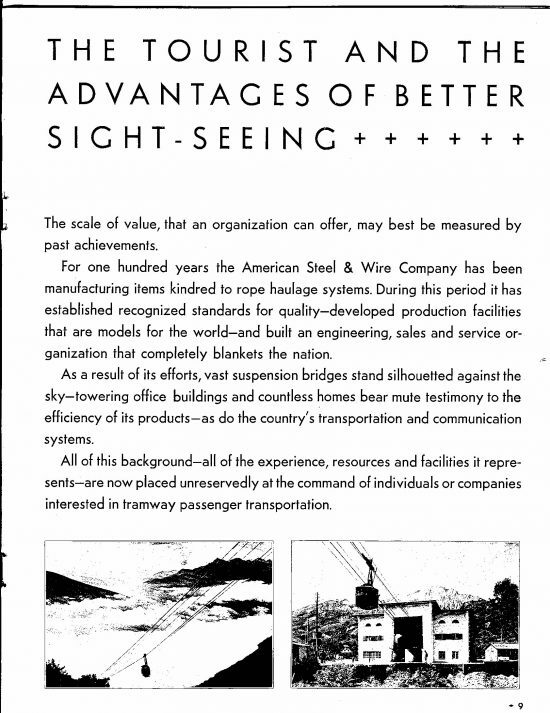 As early as 1890 Bleichert-Trenton Systems appeared in the desirable market of the western states; initially at the silver mines of Aspen, Colorado. 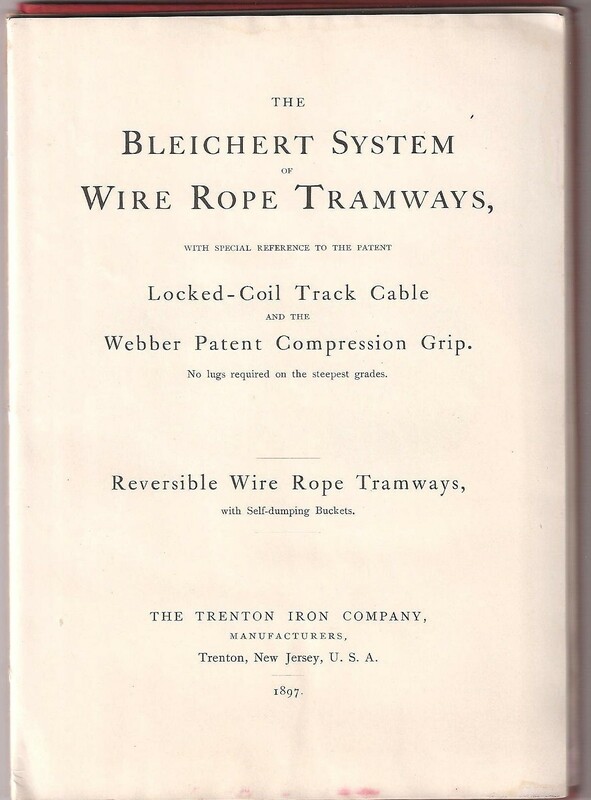 The Two-rope Bleichert-Systems replaced rapidly the mono rope system and by the end of the 19th century the Bleichert-Trenton-System dominated the market. 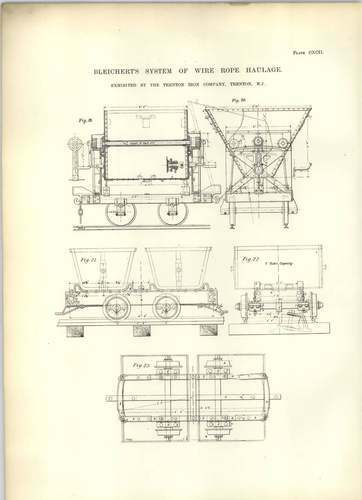 At the Chicago world’s fair (Columbian Exhibition) in 1893 the Trenton Iron Company exhibited at the Transportation Pavilion and extensive Bleichert-System. 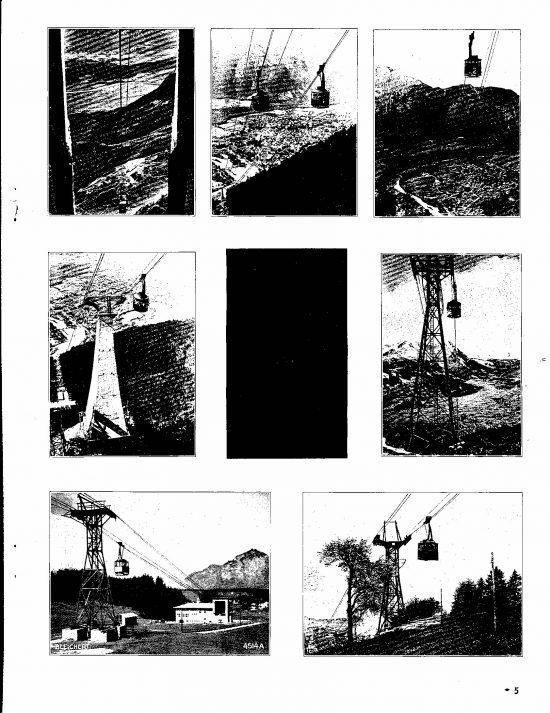 Adolf Bleichert himself visited the fair. 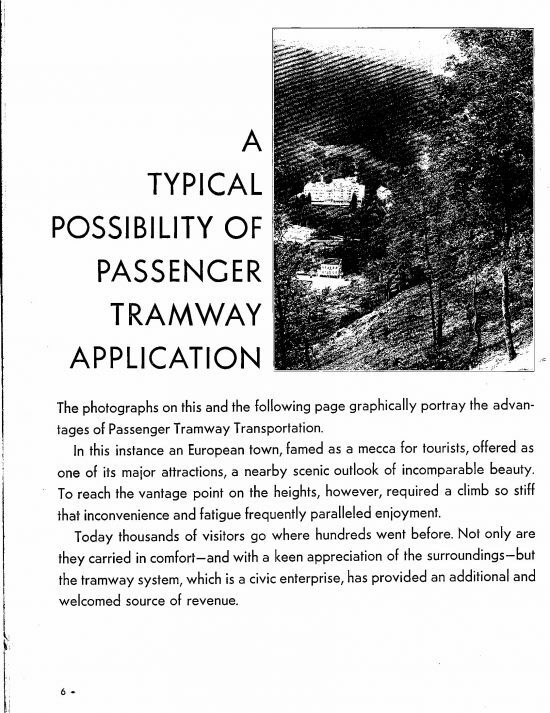 In the early nineties and possibly as a result of the World’s Fair the market for Bleichert-Trenton Systems exploded. 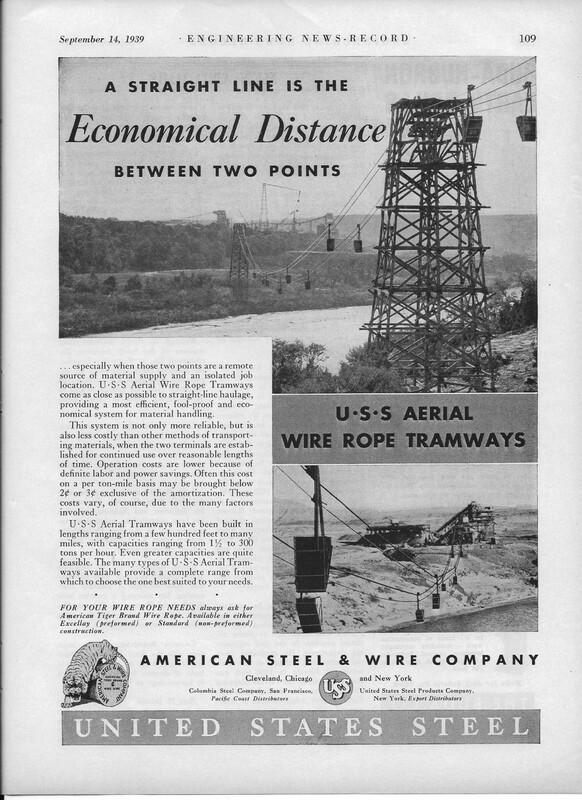 Max Bleichert as well visited the United States. 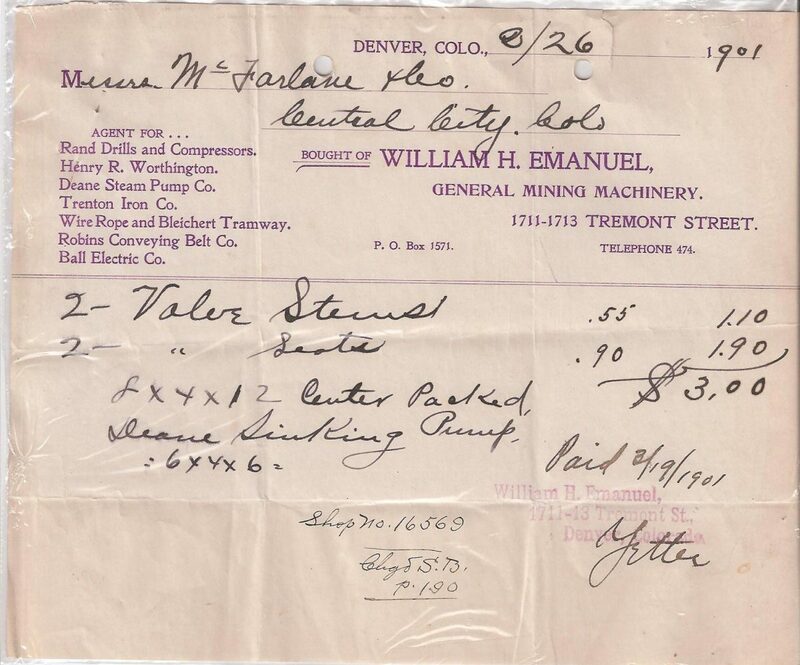 In 1900 he was for further training at Trenton and was recalled by the death of his father. 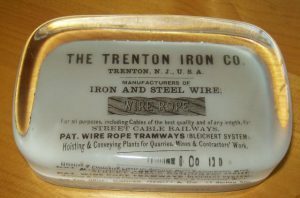 The Trenton Iron Company was part of the larger Cooper & Hewitt steel group, for which Peter Cooper had established the first foundry in Trenton in 1844-45. 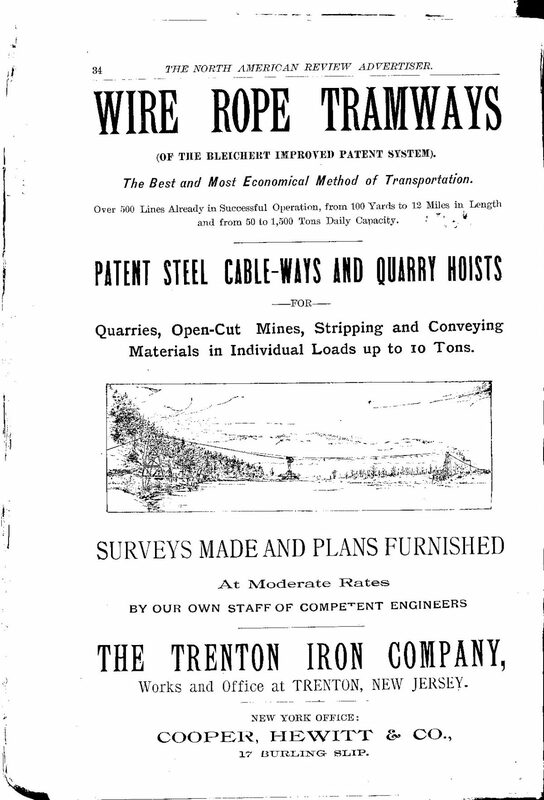 Under several names, Trenton Iron Company – South Trenton Iron Company – New Jersey Steel & Iron Company – American Bridge Company – U.S.Steel, the original company operated until 1989. 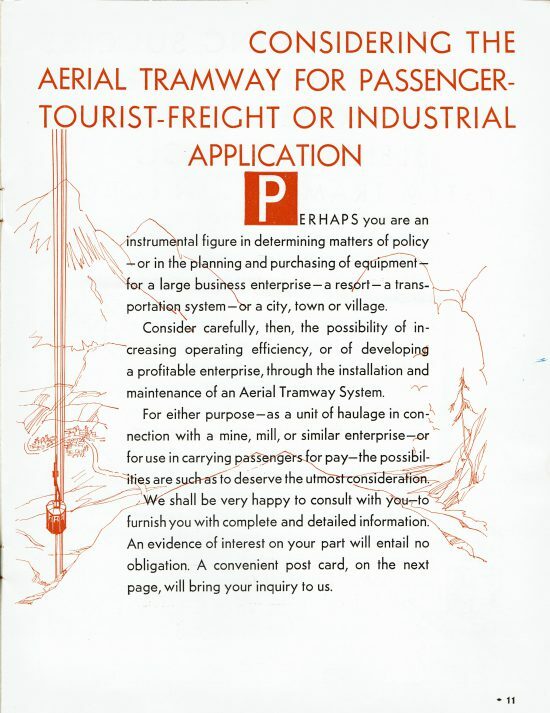 A copy of the license agreement has not been found to date. 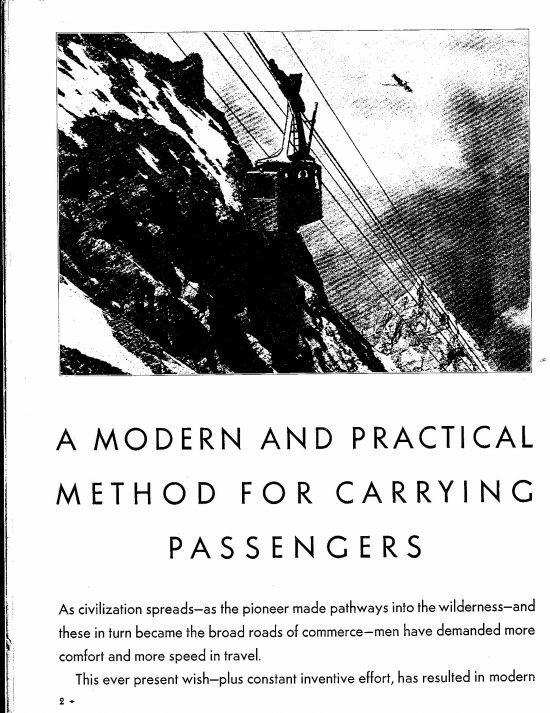 However, it is suspected that it might be in the archives of the “City of New York Museum’. 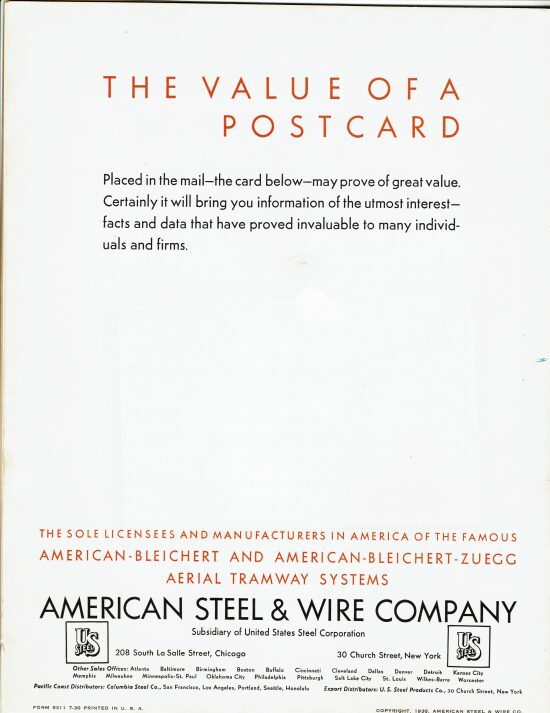 It holds all documents of Cooper, Hewitt & Co. 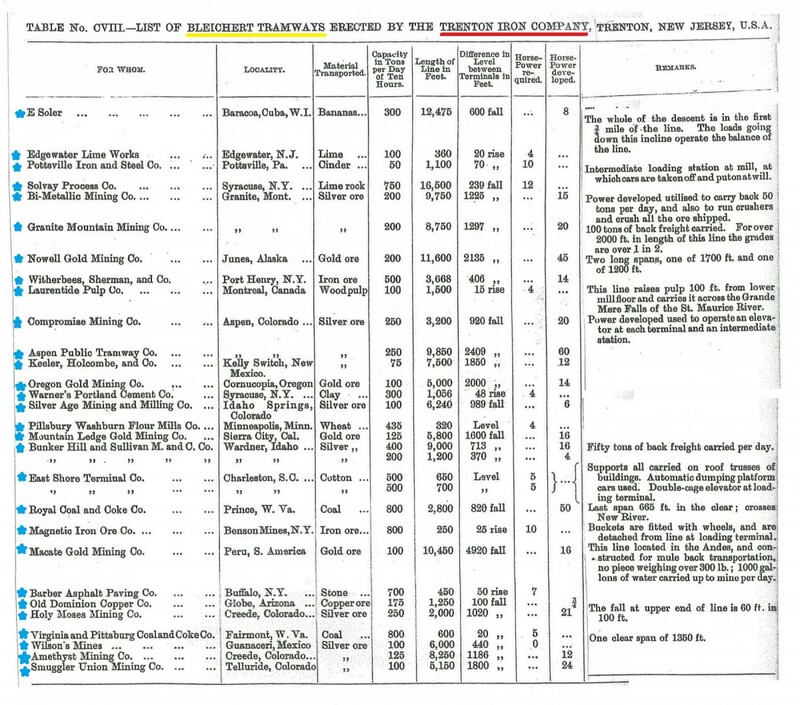 It seems to be likely that all installations listed for the United States in the 1893 Bleichert brochure “Adolf Bleichert Spezialfabrik für Bleichert’sche Drahtseilbahnen’ are Trenton built Bleichert installations.